I rushed to the other side of the house and sure enough. There was a happy dog accompanied by a missing 4-inch, Y shaped pork chop bone. It was not coming out the front or the back….but it had to come out. We proceeded to the Vet emergency room to have emergency pork chop bone surgery in the middle of the night. 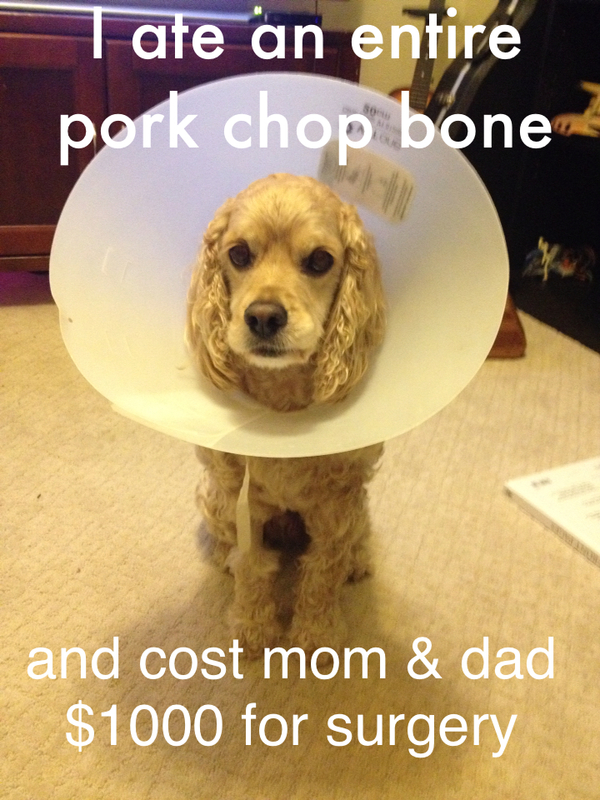 $1,000 later, we received the pork chop bone and a very sore cocker spaniel. We watched him closely for a few days to make sure that he was the same dog. We were worried that the experience was going to change his sweet personality. He is the same old dog. Like nothing happened. So first of all, that is just an experience you don’t want to repeat. Secondly, it was a good lesson in the risk management of “left overs”. Most importantly, when something terrible happens to something you love it magnifies its value. You can buy new stuff. But healthy, family and spirit are all more valuable than we think. In this case, Harvey is now worth $1,000 more than he was before the great pork chop bone incident of 2014. Posted in Family, Uncategorized.Tagged Family, Growth, Leadership, Learning, Musings, Perspective, Stories, Thoughts, Wisdom.